Here is an update on the price-to-rent ratio using the First American CoreLogic price index released yesterday for house prices through January. This suggests that house prices are still a little too high on a national basis. But it does appear that prices are much closer to the bottom than the top. Also, OER declined slightly again in February. The price index has declined 6 of the last 8 months, although most of the declines have been very small. 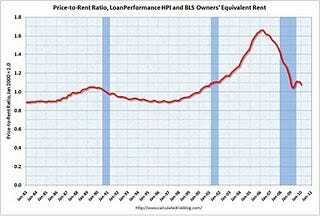 With rents still falling, the OER index will probably continue to decline – pushing up the price-to-rent ratio.